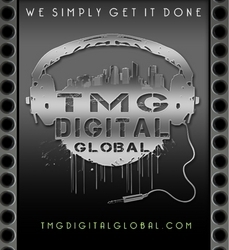 TMG Digital Global has taken position as the leading Global Media Distributor for Independent Musicians and Record Labels by leveraging over 40 years combined experience in Media Distribution Support Services. The Digital Media Distributor has secured strategic alliances with industry leaders with a visionary approach to online media distribution, including its back end partners INgrooves/Universal, enabling TMG Digital Global to focus on identifying and fast tracking the independent musicians and record labels with the most potential for success in the realm of Global Media Distribution. Digital Media Distributor TMG Digital Global is making waves in the world of online music distribution, and the mainstream industry is beginning to take notice. Founder and President Eric L. Purvis has assembled a Global Media Support Staff with over 40 years combined experience in various facets of Media Distribution Support Services, all striving toward a shared vision of empowering the Independent Musician with major Media Distribution Services. Along with its back end partners INgrooves/Universal, TMG Digital Global gives the Independent Musician the tools to advance their artistry in the new Global Media Marketplace. Capitalizing on relationships cultivated over the course of careers at record labels such as Virgin Records, Island Def Jam, and Capital Records, as well as key online media distributors like Universal Music Group and Sony Music, and major film studios such as New Line Cinema, Sony Pictures, Twentieth Century Fox, Universal Pictures, and Dreamworks, TMG Digital Global has already secured several strategic alliances. In addition to working with its back end partner INgrooves/Universal, TMG Digital Global has entered into a joint venture with The AIO Corp, an industry leader in the creation of interactive digital platforms, maximizing TMG Digital Global’s effectiveness in reaching its audiences both online and in the real world. TMG Digital Global also has upcoming releases from hip-hop and soul labels, with Anomaly Music Group’s David Verity readying his R&B debut for TMG and “Louie Jeans,” the hotly anticipated single from FLY BOY ASSOCIATION artist Gunnie Sanotchra available to download everywhere now. For more information contact TMG Digital Global at (877)938-6434.